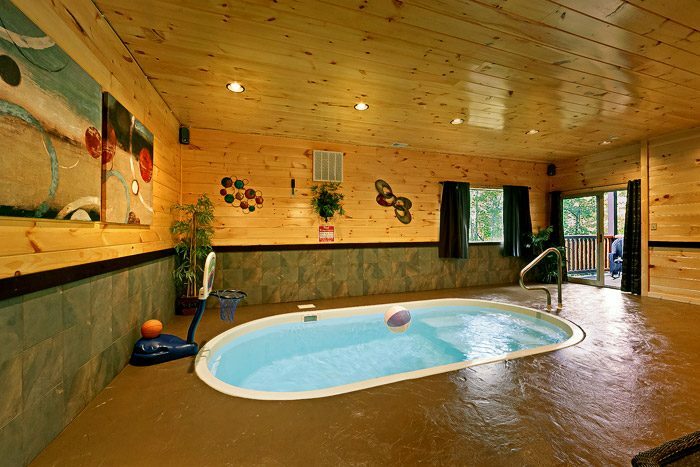 "Hickory Splash," a private Pigeon Forge area cabin with indoor pool, offers vacationers to the Smokies the utmost in luxury and a scenic location with wonderful amenities that still keeps you close to all the action. 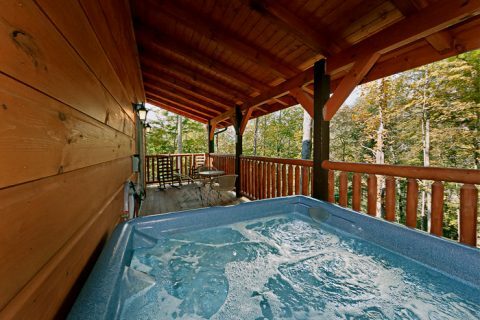 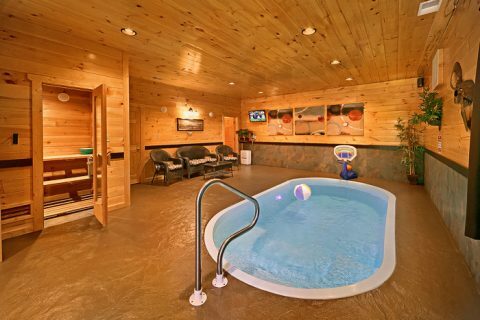 Even better, enjoy year-round night and day fun in this 2-bedroom cabin's private heated swimming pool and outdoor hot tub! 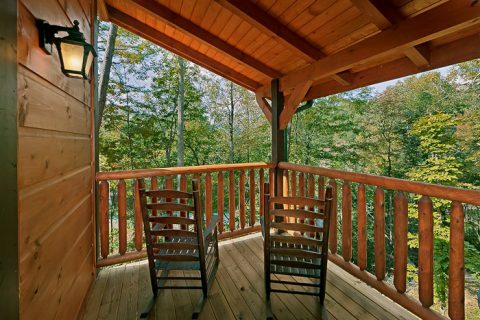 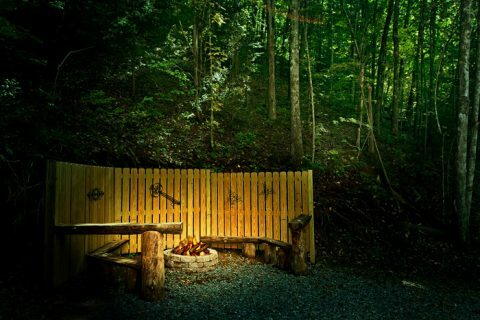 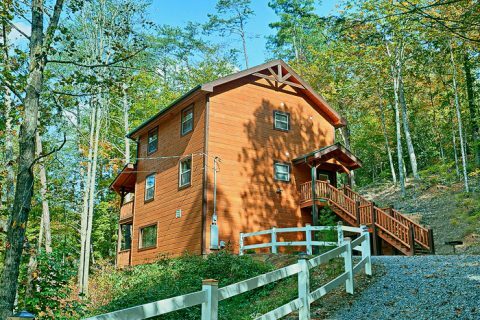 This cabin offers guests a chance to relax and unwind in the Smokies. 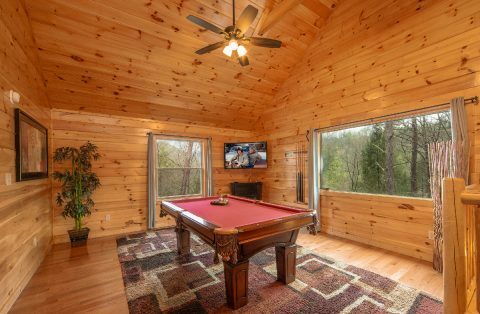 The living room's couch and chairs plenty of seating around the large flat screen television for watching the big game, while the large windows let in plenty of light and natural views, creating a warm, welcoming oasis in the mountains. 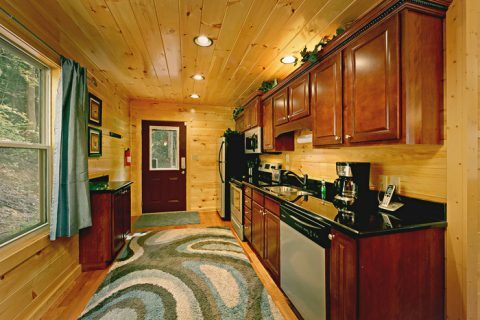 The fully equipped, galley style kitchen, with stainless steel appliances, and charcoal grill makes for easy meal preparations. 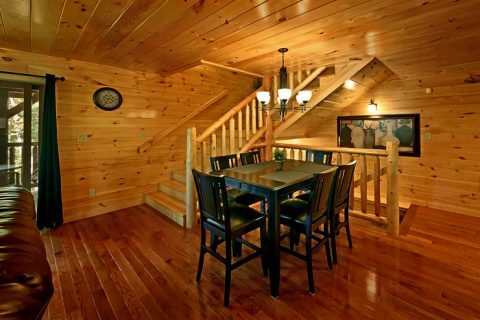 Enjoy your fresh made meal in the cabin's dining room with plenty of seating for the entire family to share meals together. 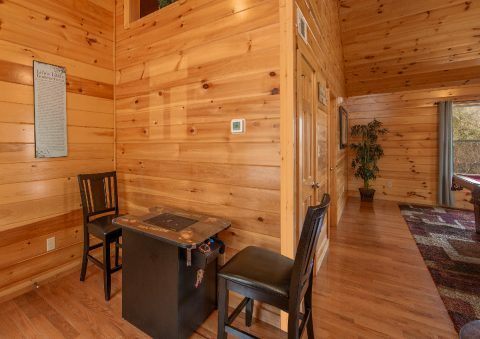 This 2-bedroom cabin sleeps up to 6 guests in comfort and style. 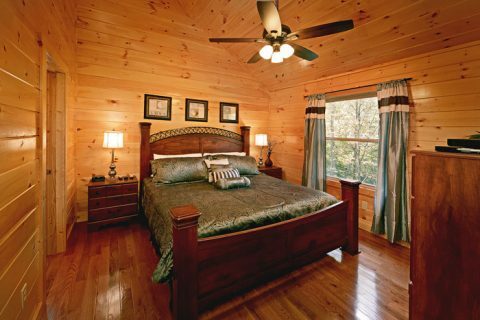 The main level's bedroom features a king-size bed, flat screen television, soothing jacuzzi tub, and rain shower head in the full bath for plenty of relaxation. 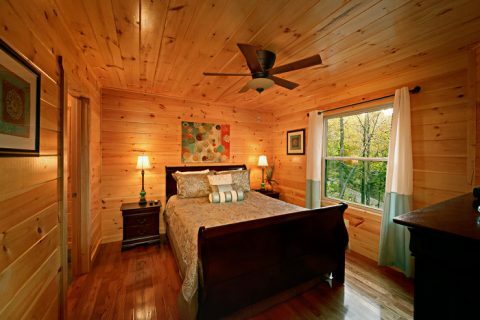 Upstairs, guests will find another king-sized bedroom, flat screen television, and private, full-size bath. 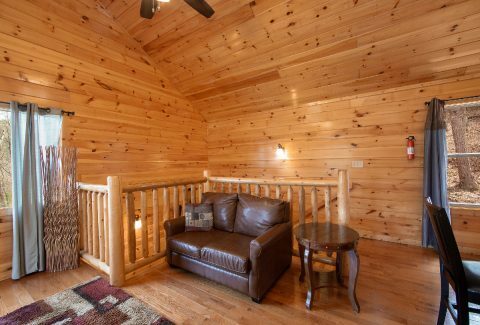 There is also a full-sized bed in the nearby alcove in the loft. 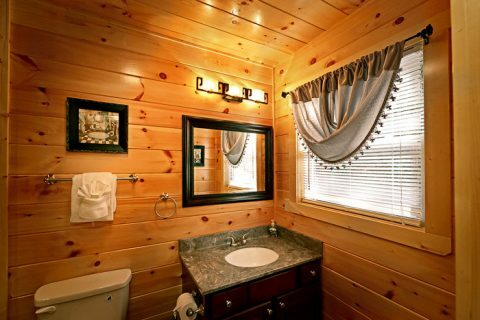 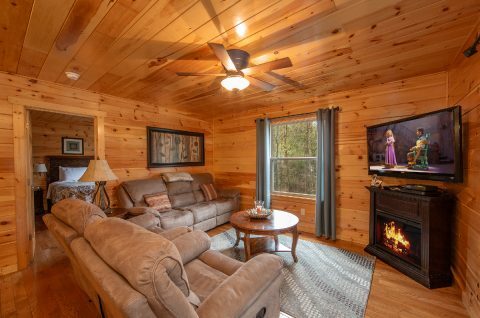 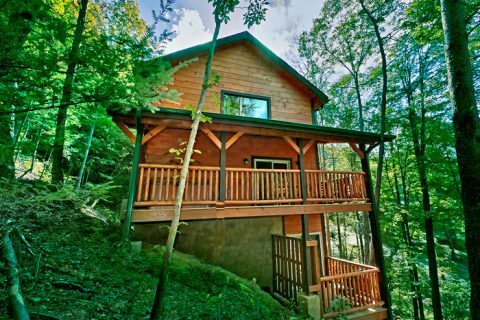 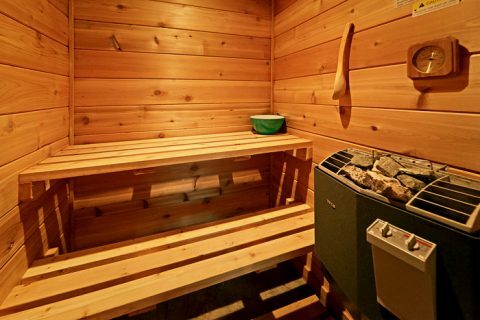 Book this remarkable private Pigeon Forge area cabin with indoor swimming pool online with Cabins USA for an immediate Online Cabin Discount and the beginning to an exciting family adventure in the Tennessee Smoky Mountains!